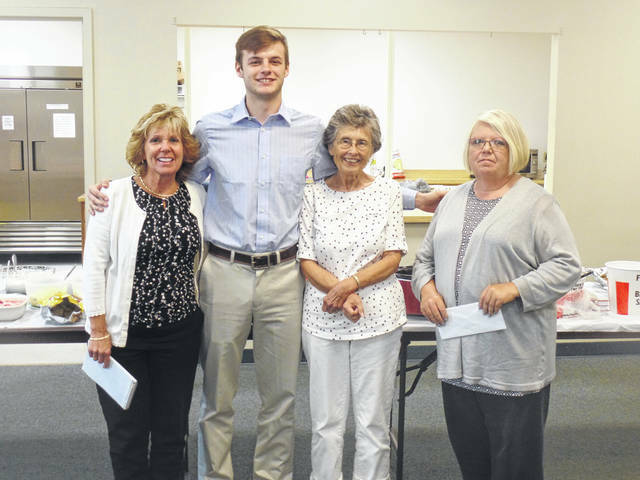 Pictured is scholarship recipient Jarrett McCarley with the Gallia County Retired Teachers Scholarship Committee. Left to right: Letty Willis, Jarrett McCarley, Nancy Hood and Beth James. Pictured are the newly retired teachers from Gallia County Local Schools who were honored at the meeting. Left to right: Cathy Greenleaf, Lorna Nomina, and Karen Polcyn. GALLIPOLIS — The Gallia County Retired Teachers met on June 7 at noon at the First Baptist Church in Gallipolis. President Ollie Tipple welcomed the group. Jeri Howell led the Pledge of Allegiance to the flag and Nathan DuPont, youth pastor at the church, led everyone in prayer prior to the potluck covered dish meal. All recent retirees from Gallia County Local and Gallipolis City Schools were invited to be honored at this meeting. The following newly retired teachers were in attendance and were welcomed by President Tipple: Lorna Nomina, Cathy Greenleaf, and Karen Polcyn. 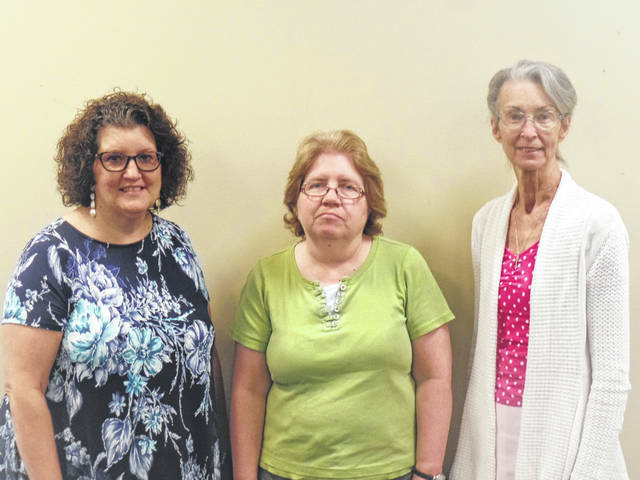 All three ladies are recent retirees from Gallia County Local Schools. The following were wished happy birthday for May and June: Jean Meek, Lorna Nomina, Lynn Arnott, and Cathy Greenleaf. Sympathy cards were mailed to the family of Mila Woods and Audrey Davis. The scholarship committee chair, Letty Willis, and committee members Nancy Hood and Beth James announced the scholarship recipients as follows: Bailey Watson who is a recent graduate from Gallia Academy High School. Miss Watson plans to major in elementary education. Brooke Campbell who is a recent graduate of South Gallia High School. Miss Campbell plans to major in mathematics education. Jarrett McCarley who is a recent graduate of River Valley High School. He plans to major in elementary education. Jarrett was the only scholarship recipient able to attend the luncheon. The treasurer’s report was given by Jack James and approved. The minutes from the April meeting were in the last issue of The Slate and were approved. President Tipple reminded the membership that she will not be returning as president starting the new year. A President-Elect is needed to be ready to step in and take over at that time. Door prizes were awarded and the meeting was adjourned. The next meeting will be on Thursday, August 9 at noon at Bob Evans. Reservations will be due by August 1 to Julie Dragoo. The guest speaker will be Andrea Busser from AMBA.